We will be having our Spine , Cord and SIJ MRI Workstation workshop in Abu Dhabi on the 1st and 2nd of December 2017. Spinal imaging is such a common area to image but we often dont get taught a structured way to assess the spine and the various pathologies or see enough to get really confident in assessing Spinal MRIs. This will be an intensive 2 day workshop with a comprehensive coverage of Spinal, Cord and SIJ imaging and pathology. Our workshops have been very popular as they provide hands on learning where you see 100’s of dicoms on your own individual workstations. You will see and diagnose more pathology in a weekend than most people will see in years. The 3R’s: We have also commenced a 1 month post workshop review programme that is included with the workshop. One of the big issues is forgetting. We all know the feeling of learning and then rapidly forgetting what we have learnt. 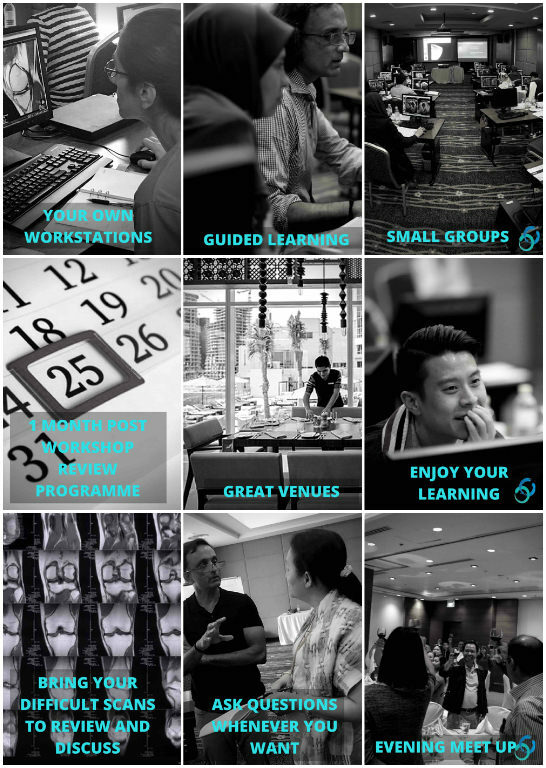 To get around this we now have a post workshop Deliberate Practice Programme for one month, where every day you will receive a post, video or dicoms to view on topics we have covered in the workshop. Review images and scans, Refresh your memory and Retain more of what you have learnt.